Summary: We report a rare situation in which a lipomyelomeningocele and an intramedullary arteriovenous malformation (AVM) occurred together at the T11–L1 level in a 44-year-old man. MR images showed a hypervascular lesion intradurally and a fatty component extradurally. Spinal angiography revealed this lesion to be an intramedullary AVM with multiple feeding arteries from the right T12 and left T10 intercostal artery and the left L1 lumbar artery, drained by tortuous, dilated, perimedullary veins. Among the arteriovenous malformations (AVMs) of the spinal cord, an intramedullary malformation with the nidus of the fistula in the cord parenchyma is uncommon. Intramedullary AVMs are congenital abnormalities, and patients are generally less than 40 years old when symptoms begin (1). In about half the patients, acute presentation is precipitated by subarachnoid or intramedullary hemorrhage. In the other half, there is a gradual onset of symptoms, probably due to ischemia from vascular steal phenomenon or venous congestion (2). On spinal MR images, small areas of flow void with a localized dilatation of the spinal cord can be seen. Before treatment, a complete angiographic study is necessary to obtain more accurate information about the extent and location of the nidus, feeding arteries, and draining veins. The mainstay of treatment is embolic occlusion of the malformation achieved using particulate materials, such as polyvinyl alcohol particles, or liquid materials, such as isobutyl 2-cyanoacrylate (3). Sacral lipoma, whether of the intramedullary or lipomyelomeningocele type, constitutes only 1% of all spinal axis tumors (1). Lipomyelomeningocele is a subcutaneous lipoma of the lumbosacral region connected by a fibrous stalk traversing a bony defect to an intradural and intramedullary fatty mass. Early surgical repair is usually recommended, because spinal cord tethering with neurologic deterioration is possible at any age (4). We report a case of a combined intramedullary AVM and lipomyelomeningocele, notable for the diagnostic and therapeutic problems involved. A 44-year-old man presented with a 7-year history of stiffness and paresthesia in both lower extremities. His symptoms were aggravated by exercise, especially walking. Neurologic examination showed hypesthesia and hyperalgesia below the T9 level without any motor weakness. 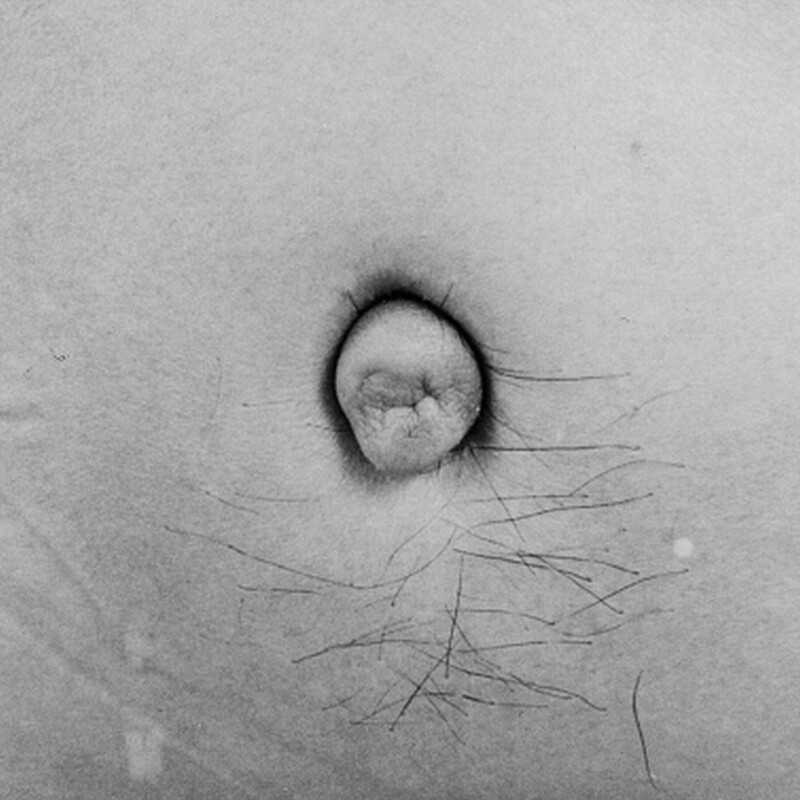 On physical examination, a skin dimple with hair was noted on the patient's back (Fig 1). Plain radiographs of the thoracic spine revealed spina bifida at the T11 to T12 levels. MR studies showed an intradural high-signal mass on both T1- and T2-weighted images, intermingled with multiple signal voids, extending extradurally. Contrast-enhanced T1-weighted images revealed a well-enhancing lesion with high signal intensity (Fig 2). Spinal angiography showed a vascular mass supplied by the radiculodural branches of the right T12 and left T10 intercostal arteries and the left L1 lumbar artery. The delayed phase showed drainage by a tortuous perimedullary vein that was dilated caudally, implying associated venous hypertension (Fig 3). Embolization was performed through the right T12 intercostal artery. The feeder of the radiculodural branch of the right T12 intercostal trunk was superselected with a Microferret-18 catheter (Cook, Bjaeverskov, Denmark) and Dasher-14 guidewire (Target Therapeutics, Fremont, CA), and a 33% glue mixture of n-butyl cyanoacrylate (NBCA) was injected through this feeder over 2 minutes. 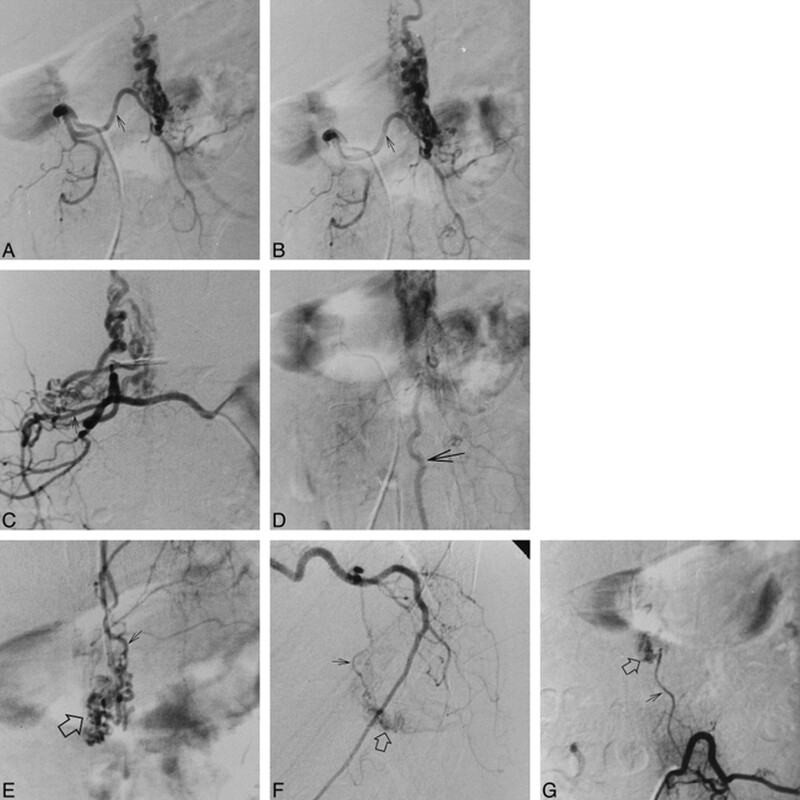 Angiography performed 20 minutes after injection of glue showed effective devascularization of the perimedullary AVM with a small residual nidus supplied only by the left L1 lumbar artery (Fig 4). 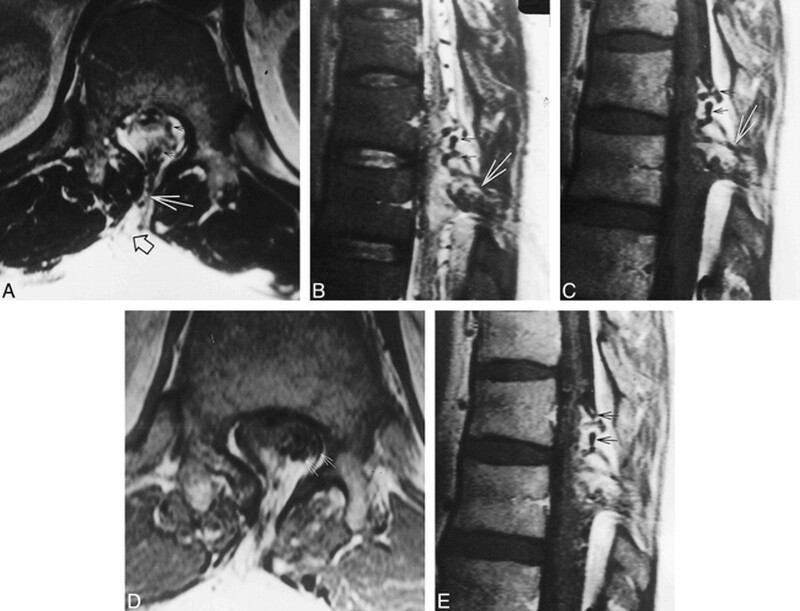 MR examination after embolization revealed a decreased angiomatous component in the spinal cord mass and prominent venous plexus in the epidural space on both noncontrast and contrast-enhanced images. 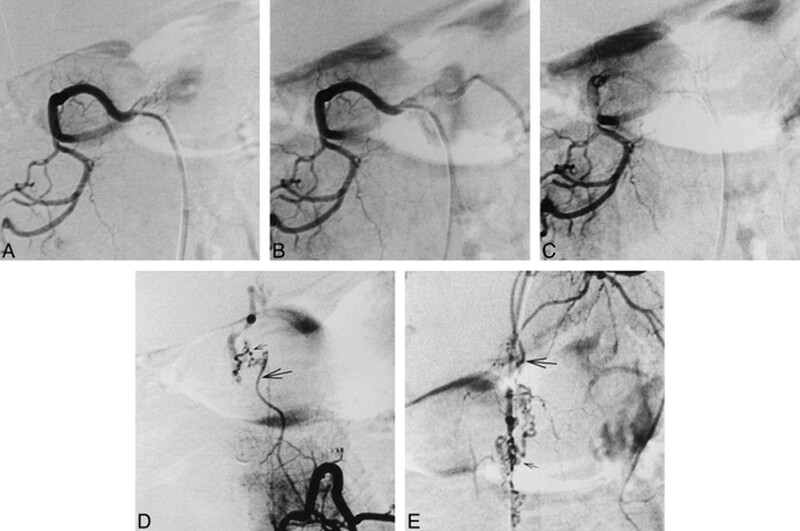 This was most likely due to sluggish flow after embolization (Fig 5). MR images of the thoracic spine. A–C, Axial (A) and sagittal (B) T2-weighted images and sagittal noncontrast T1-weighted image (C) show a high-signal intradural mass containing multiple signal voids (small arrows) connected by a fibrous stalk (large arrow) to an extradural high-signal mass (open arrow, A). D and E, Axial (D) and sagittal (E) contrast-enhanced T1-weighted images show a vascular lesion with multiple signal voids coiled in a serpentine-like manner (arrows). A–D, Spinal angiography by catheterization of right T12 intercostal artery. Oblique views of early (A) and late (B) arterial phase, lateral view of late arterial phase (C), and oblique view of venous phase (D) reveal a vascular mass with a feeding artery (small arrow, A–C) and caudal drainage by a tortuous, dilated perimedullary vein (large arrow, D). E–G, Angiograms after selection of left T10 intercostal artery, anteroposterior (E) and lateral (F) views, and left L1 lumbar artery, anteroposterior view (G), show this vascular lesion to be an AVM (open arrow) with multiple feeders (closed arrow). Angiography via right T12 intercostal artery after embolization. A–E, Anteroposterior views of early (A) and late (B) arterial phase and venous phase (C) show effective devascularization of perimedullary AVM with small residual nidus (small arrow) supplied from left L1 lumbar artery (D) and from left T10 intercostal artery (E) feeders (large arrow), and sluggish venous drainage. 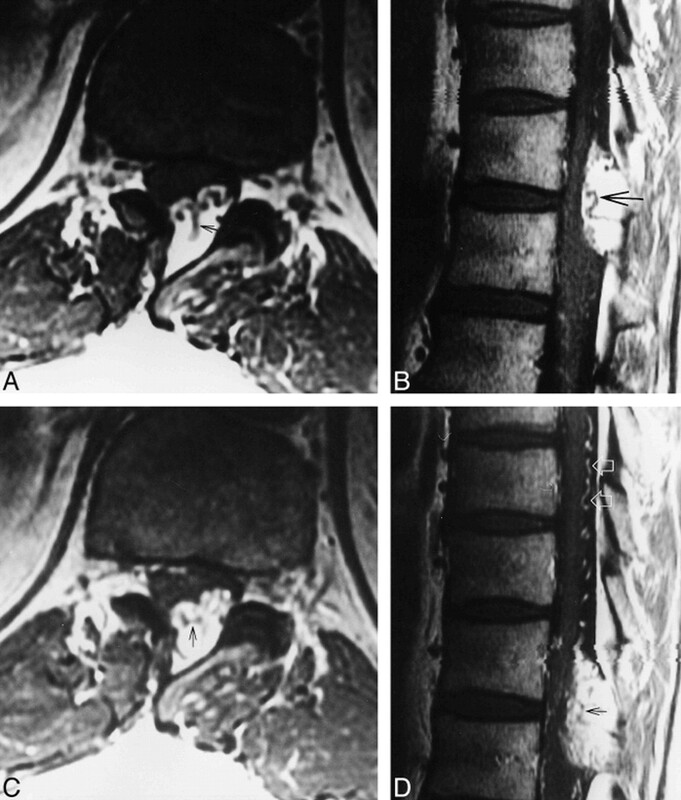 A and B, Axial (A) and sagittal (B) views after embolization show a decreased vascular component in the spinal cord mass without signal change of the cord. The low signal intensity lesion in the mass seems to be a thrombus (small arrow), extending to the superior portion of the mass and shaped like a bird's beak (large arrow, B). C and D, After contrast administration, axial (C) and sagittal (D) views reveal prominent venous plexus (open arrows, D) in epidural space, probably due to sluggish blood flow, and thrombus (closed arrow). A, Histologic examination of the intradural mass disclosed an AVM (large closed arrows) embedded in mature adipose tissue septated by thin fibrous tissue (small closed arrows). The vascular channels were variable in size and shape. Note both arteries and veins with or without elastic laminae. Some arteries were dilated with embolizing agents (open arrows) (Elastic, original magnification ×100). B, Arterialization of venous walls (arrow) is suggestive of high pressure due to arteriovenous shunting. Note the absence of elastic laminae in the irregularly thickened vascular wall (Elastic, original magnification ×100). Five days later, the patient underwent total laminectomy of T11–L1, subtotal resection of the lipoma, and untethering of the lesion with dura reconstruction. Intraoperative findings showed the stalk of the skin lesion to be connected to the dura through the lamina defect between the T12 and L1 spinous processes. The stalk and the lipoma itself consisted of lipoma tissue entangled with many abnormal vessels, but most of the vessels were thrombosed with embolic material. After surgery, the patient was free of his postoperative symptoms, and 2 weeks later he was able to walk alone. Six months after discharge, he had made a complete recovery, with no residual neurologic deficits. Histologic examination confirmed that this intradural mass was an AVM embedded in adipose tissue, as had been expected preoperatively. Spinal lipomas are usually thought to consist of three subtypes: intramedullary lipomas, lipomyelomeningoceles affecting the spinal cord, and lipomas of the filum terminale with limited involvement of the lowest level of the conus medullaris (1). Spinal AVMs also are divided into three types. Whereas intramedullary and perimedullary AVMs are of congenital origin, dural arteriovenous fistulas are considered to be acquired lesions, occurring in patients over 40 years of age (1). Only two cases of combined lipoma and spinal AVM have been reported (1, 5). This lesion can result in more complicated neurologic deterioration because of severe cord distortion and venous hypertension (5). A combined AVM and intramedullary lipoma probably originates from mesenchymal tissue that did not regress during the embryonic period. AVMs most likely develop during the late somite stage in the fourth to eighth week of embryonic life. Early in the third week of embryonic life, angioblasts begin to differentiate from the mesoderm, forming syncytial islands. These small clumps of syncytial cells develop tiny sprouts that interconnect the cell groups, forming a syncytial plexus that later differentiates into the primordial vascular plexus. These plexus contain afferent, efferent, and capillary portions. AVMs arise from persistent direct connection between the future arterial and venous sides of this primitive vascular plexus without the capillary component (6). Lipomyelomeningoceles originate from the focal premature dysjunction of neural ectoderm from cutaneous ectoderm that allows migration of periaxial mesoderm into the developing neural tube. This pluripotent mesoderm primarily develops into fat, but may also develop into other tissues, including blood vessels. So the combined lesion might be explained by the focal maturation of this pluripotent mesoderm, which migrates between the two ectodermal layers and primarily matures as a lipoma in the primitive vascular plexus. Subsequent failure to form the capillary component in this plexus might lead to the formation of a combined lesion (7). There are two therapeutic strategies for intramedullary AVMs: microsurgical therapy and endovascular therapy (5). Surgical treatment alone for intramedullary AVMs carries greater risks, particularly for lesions within the thoracic and lumbar segments, because proximal ligation of the arterial supply of AVMs can lead to the formation of multiple small collaterals to the AVMs. This makes further embolotherapy more difficult. Moreover, most intramedullary AVMs are inoperable, because the tangle of abnormal vessels fills almost an entire segment of the spinal canal and contains cord tissue within the interstices of the AVMs (3). With improved microsurgical technology, many intramedullary AVMs can be removed by using the same standard techniques used to treat intramedullary tumors. Since the 1960s, endovascular therapy has been performed as an alternative treatment of AVMs. Preoperative particulate embolization markedly decreases intraoperative bleeding and makes the dissection of the nidus much easier (3). It also diminishes the threat of further hemorrhage and improves the perfusion of the spinal cord by diminishing the steal or venous congestion secondary to the malformation (5). The NBCA glue mixture that we used for embolotherapy is preferred to large embolic agents, such as platinum coils and silk, or to particulate agents, such as polyvinyl alcohol, in spinal embolization because it is less likely than silk or coils to cause enlargement or hypertrophy of collateral feeders, with ultimate reconstitution of the nidus, and it has a lower rate of recanalization of the feeder after embolization relative to particulate agents (8, 9). We used a combination of endovascular and microsurgical therapy for this patient. The intermingling of the malformation and the lipomyelomeningocele required the surgical removal of both lesions by total laminectomy of T11–L1, subtotal removal of the lipomyelomeningocele, and untethering with dura reconstruction. The procedure resulted in remarkable improvement of the patient's symptoms, which had included gait disturbance provoked by pain in the lower extremities. The resolution of symptoms perhaps resulted from removal of the lipoma, which caused untethering of the cord, as well as from removal of the AVM, which relieved venous hypertension and congestion of the cord. 1 Supported by a research grant from the Seoul National University Hospital. ↵2 Address reprint requests to Hyun Jib Kim, MD, PhD, Department of Neurosurgery, Seoul National University Hospital, 28 Yongon-dong, Chongno-gu, Seoul, 110–744, South Korea.